Gray leaf spot initially appears as spots on the leaves that are round or oval, tan in color, and have a dark brown border. When the leaves are wet or humidity is high, the leaf spots turn gray and fuzzy with profuse spore production. 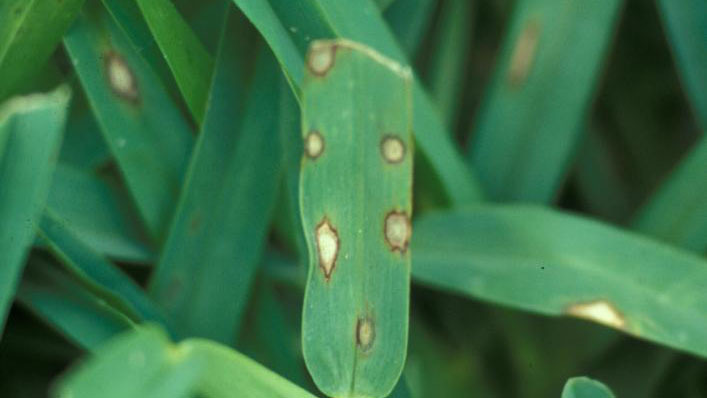 In time, the leaf spots expand and girdle the leaf, causing it to die back from the tip. Significant damage to the turf stand may occur as the disease continues to progress. 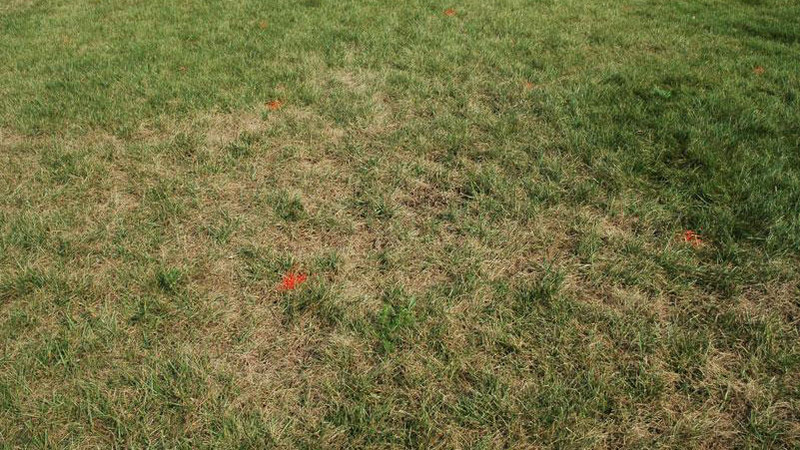 In tall fescue and perennial ryegrass, foliar blighting initially occurs in patches from 4 to 12 inches in diameter that are orange to yellow in color. 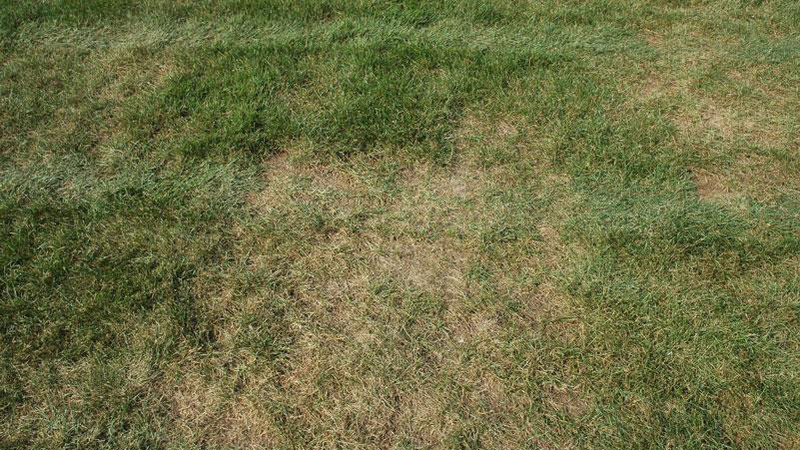 Like the leaf spots, these patches rapidly coalesce to produce large, irregular areas of damaged turf. 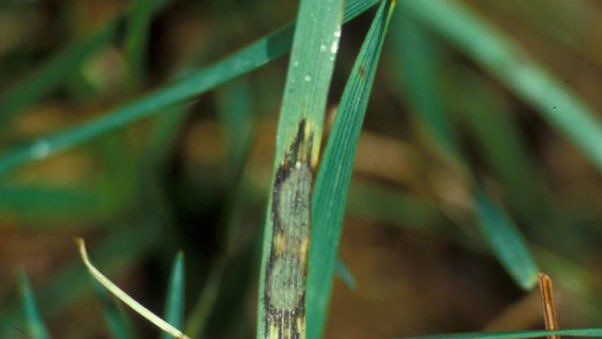 The leaves of tall fescue and perennial ryegrass blighted by gray leaf spot are typically matted and greasy in appearance. 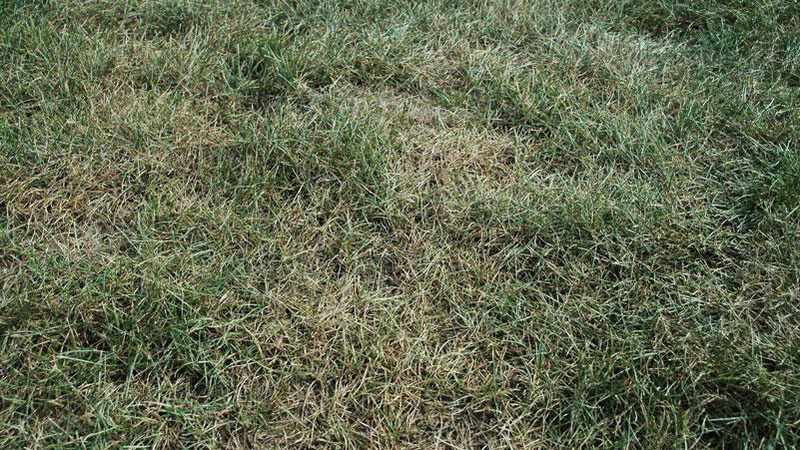 Because of this symptom, gray leaf spot is often confused with Pythium blight in tall fescue and perennial ryegrass. 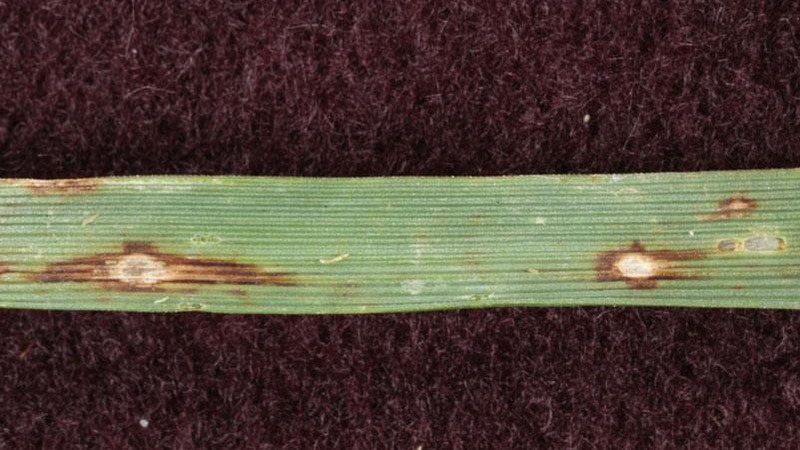 Gray leaf spot does not develop in distinct patches in St. Augustinegrass, but affected leaves may wither and die, causing a brown cast to the turf that is visible from a distance. 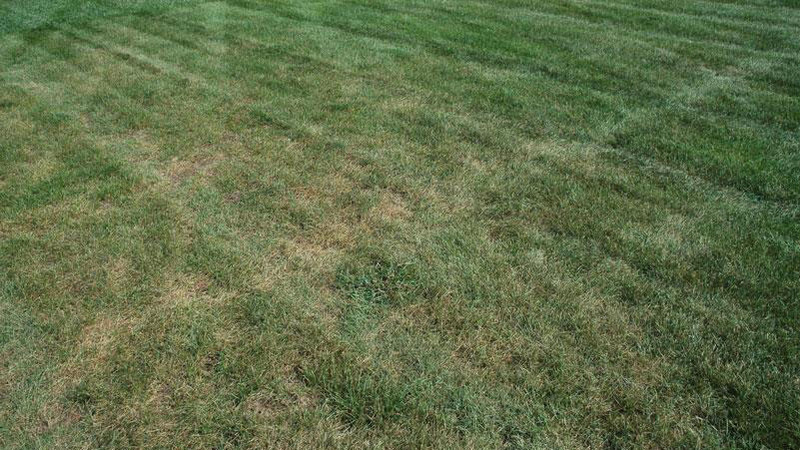 Gray leaf spot is most severe in newly established turfgrass stands. The disease is typically most severe in the first year of establishment, but then gradually becomes less damaging as the turf matures. 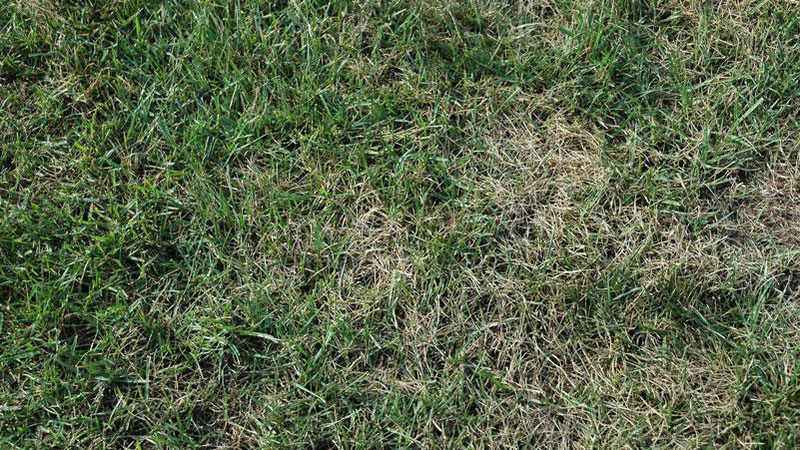 Turfgrass hosts vary widely in their susceptibility to damage from gray leaf spot. 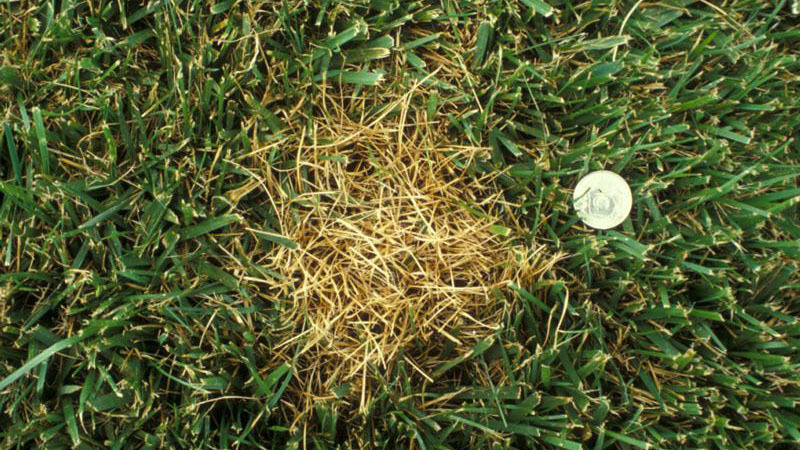 Perennial ryegrass is most rapidly affected by the disease, with widespread turf loss occurring in a period of a few days. 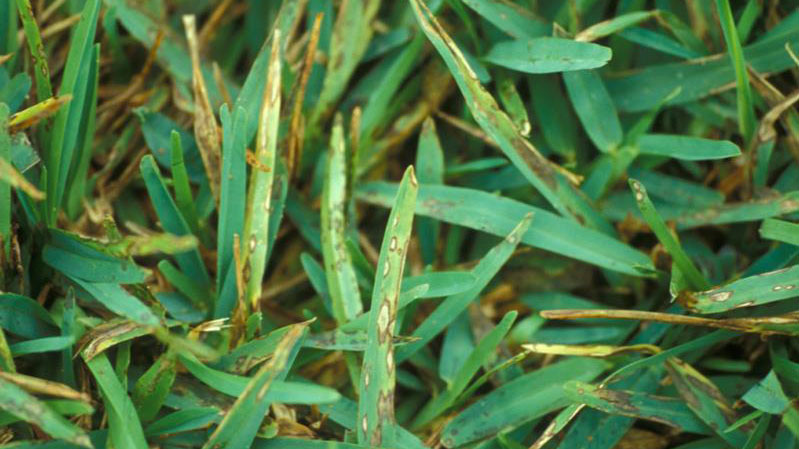 St. Augustinegrass is most resistant, and rarely sustains significant damage if properly managed. 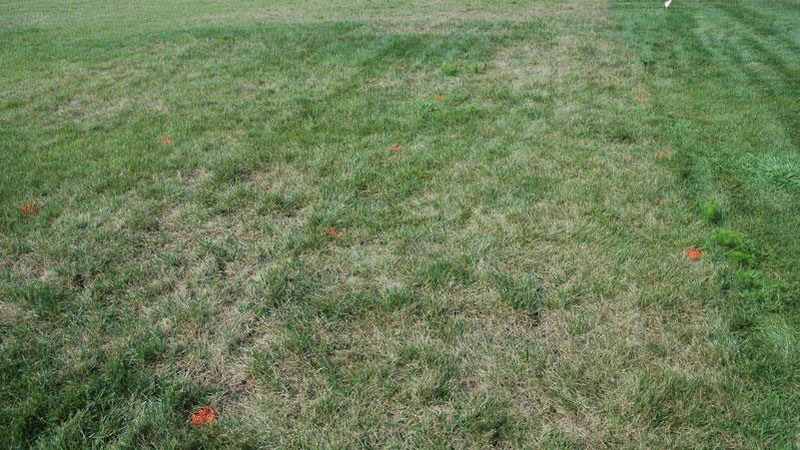 Tall fescue has an intermediate level of resistance to gray leaf spot. 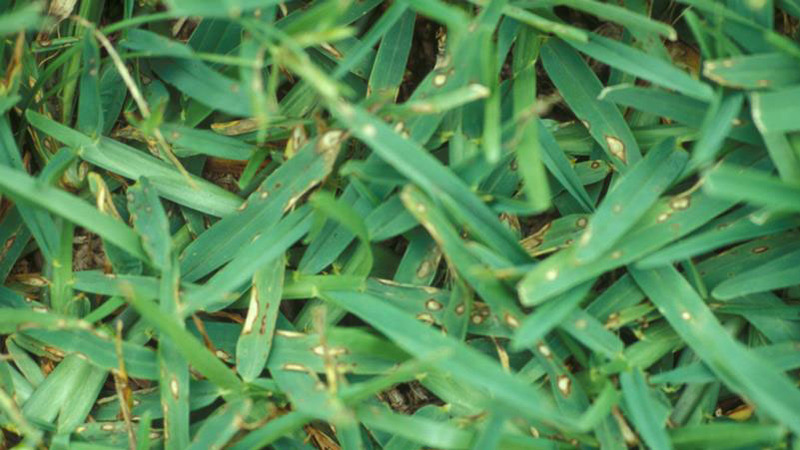 In St. Augustinegrass, gray leaf spot is most active from June through August. 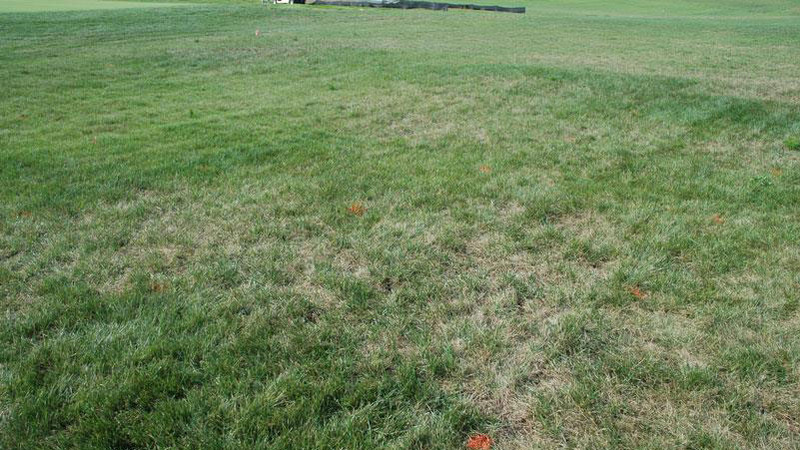 In tall fescue and perennial ryegrass, most cases of the disease appear from late July through September. 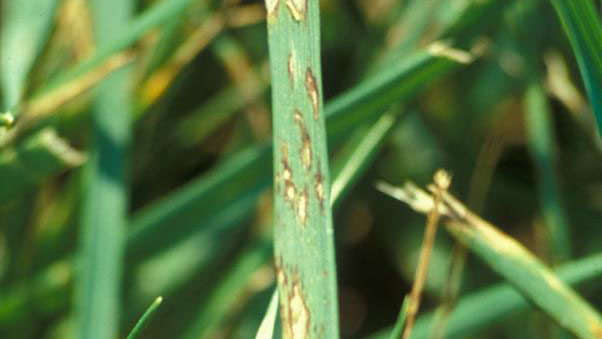 Gray leaf spot may develop when temperatures are between 70 and 95°F, but the fungus also requires at least 14 hours of continuous leaf wetness in order to initiate infection. Any factor that increases the amount of leaf wetness will increase gray leaf spot development such as extended periods of cloud cover, improper irrigation timing / frequency, or extended rainfall events. Lush leaf tissue produced by turf that is fertilized with excessive nitrogen is extremely prone to infection by the gray leaf spot pathogen. 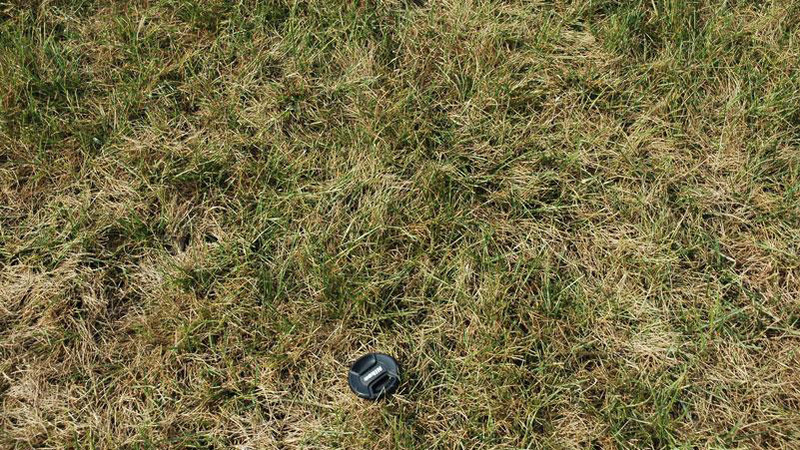 Cultivars of tall fescue and St. Augustinegrass vary considerably in gray leaf spot susceptibility. Perennial ryegrass cultivars with resistance to gray leaf spot are starting to become available. Refer to the results of cultivar evaluation trials operated by the National Turfgrass Evaluation Program or local universities for cultivars with gray leaf spot resistance that perform well in your area. 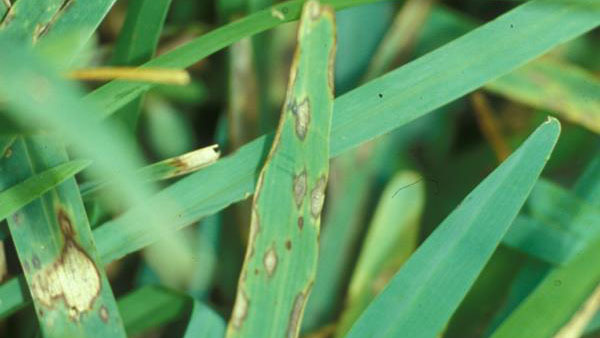 Managing leaf wetness is an effective means for minimizing gray leaf spot in all hosts. Use the Turf Irrigation Management System available on TurfFiles to schedule irrigation based on weather conditions and turf needs. Schedule irrigation early in the morning, before sunrise, and never in the late afternoon or evening. Prune or remove trees, shrubs, or other barriers to increase air movement and sunlight penetration. Proper mowing practices are most important for gray leaf spot management in St. Augustinegrass. 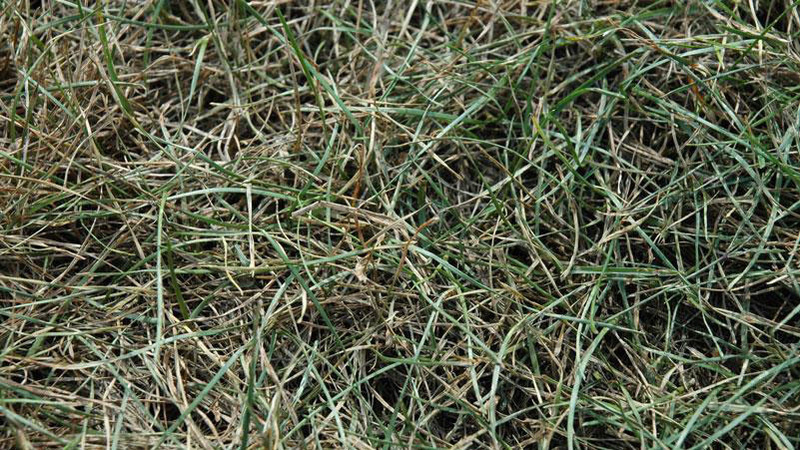 This grass must be mowed frequently during the summer months to remove excess leaf tissue, keep the canopy open and dry, and remove developing gray leaf spot lesions. 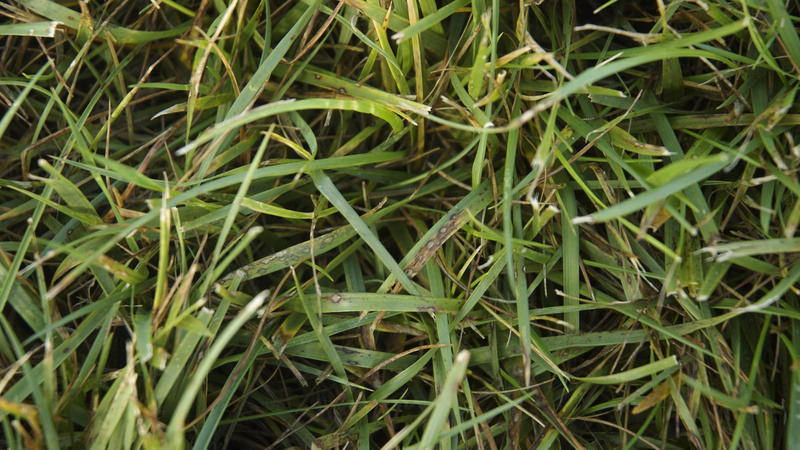 Collecting clippings reduces spread of the disease when gray leaf spot symptoms are evident. Apply nitrogen and other nutrients as recommended to maintain vigorous foliar growth during the summer months. Excessive shade, in addition to promoting leaf wetness, slows St. Augustinegrass growth and enhances gray leaf spot problems. 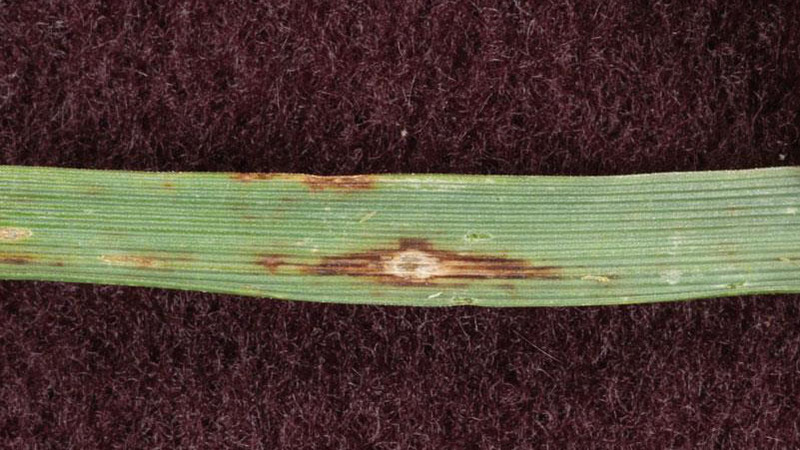 Stress of any kind will encourage gray leaf spot development in tall fescue and perennial ryegrass. Proper mowing, fertilization, and irrigation practices will reduce the chances of significant turf loss from this disease. Mow to recommended heights, using the “1⁄3 rule” as a guide for mowing frequency. 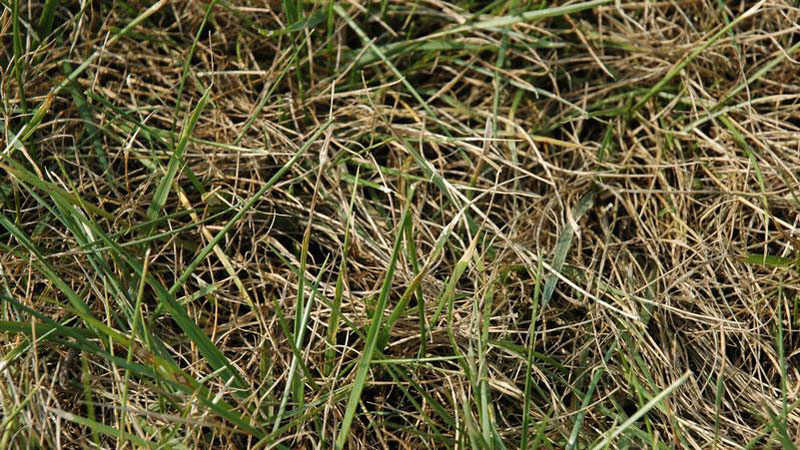 Collect clippings when gray leaf spot is active to reduce further spread of the disease. Do not apply nitrogen to susceptible grasses in late spring or summer. 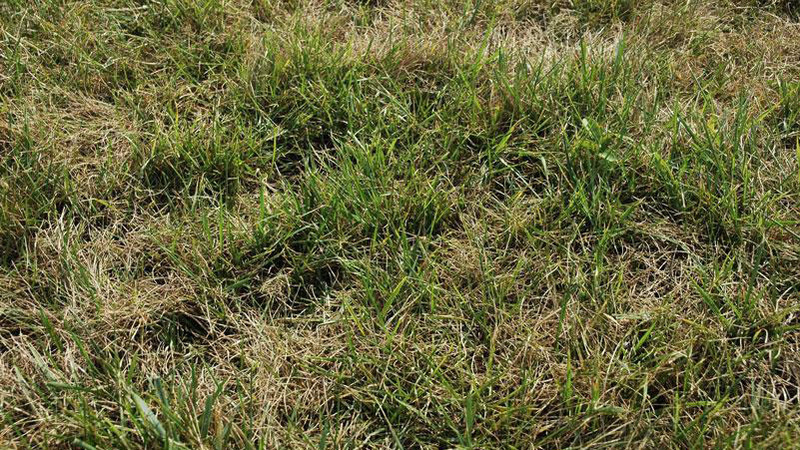 When establishing a new stand of tall fescue or perennial ryegrass, use recommended seeding rates to encourage rapid maturation of new seedlings. 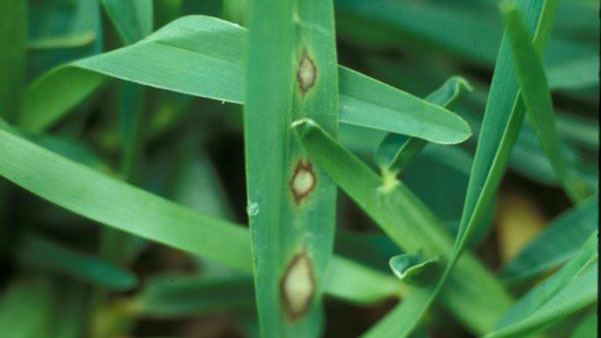 Since perennial ryegrass can sustain serious damage in a short period of time, preventative fungicide applications are recommended for gray leaf spot control. A preventative program should be initiated in mid-June or early-July in most locations, with repeat applications on a 14 to 21-day interval. Tall fescue should be monitored frequently for gray leaf spot development so that fungicides can be applied to stop epidemic development. Fungicide resistence to the Qol fungicides (Compass, Fame, Heritage and Insignia) has been documented in gray leaf spot, therefore it is necessary to rotate through multiple chemical classes when managing this disease including the use of tank-mixtures. Figure 1. Gray leaf spot. Figure 2. Gray leaf spot foliar symptoms. Figure 3. Gray leaf spot foliar symptoms. 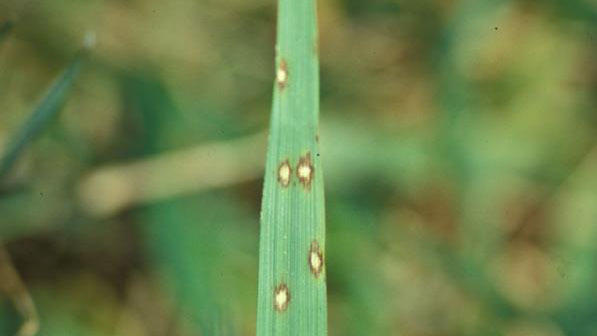 Figure 4. leaf spot foliar symptoms. Figure 5. Gray leaf spot foliar symptoms. Figure 6. Gray leaf spot foliar symptoms. Figure 7. Gray leaf spot foliar symptoms. Figure 8. Gray leaf spot foliar symptoms. Figure 9. Gray leaf spot stand symptoms. Figure 10. Gray leaf spot stand symptoms. Figure 11. Gray leaf spot stand symptoms. Figure 12. Gray leaf spot stand symptoms. Figure 13. Gray leaf spot stand symptoms. Figure 14. Gray leaf spot stand symptoms. Figure 15. Gray leaf spot stand symptoms. Figure 16. Gray leaf spot stand symptoms. Figure 17. Gray leaf spot stand symptoms. Figure 18. Gray leaf spot stand symptoms. Figure 19. Gray leaf spot stand symptoms. Figure 20. Gray leaf spot stand symptoms. Figure 21. Gray leaf spot stand symptoms. Figure 22. Gray leaf spot stand symptoms. Figure 23. Gray leaf spot stand symptoms.